The Royal Canadian Mint is proud to celebrate Canada’s 144 year-old royal heritage and its own tradition of crafting royal-themed coins with a trio of ultra-high relief, sterling silver coins featuring Princes William, Harry and Charles. 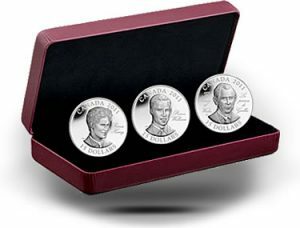 The Canadian 2011 $15 Ultra-High Relief Prince William and Prince Harry silver coins will be issued by the Royal Canadian Mint on March 15, 2011. Another issue will be available in September which features the image of Prince Charles. As the world awaits the wedding of Prince William and Catherine Middleton, the first two coins of this limited-edition sterling silver series, featuring Prince William and Prince Harry (Henry), will be available to the public on March 15, 2011. The coin featuring Prince Charles will be released in September, 2011 and the exciting variety of coins honouring Queen Elizabeth II’s Diamond Jubilee will first appear in May. Royal-watchers and collectors are invited to register at www.mint.ca/royal for updates on the many exciting coins to be offered in the Mint’s upcoming "royal" collection. "Royal themes have always been very popular on Royal Canadian Mint coins and ultra-high relief portraits of the immediate successors to Queen Elizabeth II on the Mint’s newest silver collector coins are an excellent way to support this tradition", said Ian E. Bennett, President and CEO of the Royal Canadian Mint. "As Canada counts down to the 60th anniversary of Her Majesty Queen Elizabeth II’s reign and the wedding of Prince William, the Mint is pleased to offer these finely crafted silver keepsakes to Canadians, royal watchers and collectors everywhere." Each limited to only 10,000 examples world-wide, the coins featuring contemporary portraits of Princes William, Harry and Charles were designed by Canadian artist Laurie McGaw, with the approval of Her Majesty Queen Elizabeth II. Already unique for having royal effigies on both their sides, these coins have a spectacular medallic quality imparted by their quadruple-struck, ultra-high relief. Crafted of sterling silver and bearing a $15 face value, each of these coins retails for $109.95 CAD and can be purchased individually or as a three-coin subscription. Subscribers to this series will receive a complimentary three-coin clam shell case to display and preserve this outstanding collection. All of the Mint’s products are available directly from the Mint at 1-800-267-1871 in Canada, 1-800-268-6468 in the US, or on the Internet at www.mint.ca. The coins are also available at the Royal Canadian Mint’s boutiques in Ottawa and Winnipeg, as well as through our global network of dealers and distributors, including participating Canada Post outlets.